On the map, the meandering red line seems so fixed, so set. That’s not the case! I believe a trip such as this requires flexibility, and a willingness to drop plans, take detours, and let serendipity hold the reigns and rudder the voyage. The trip will be about the back-roads and paths not etched on any map, the people met along it, largely unaffected by global tourism, the unexpected and unheard of sights, away from the beaten track. 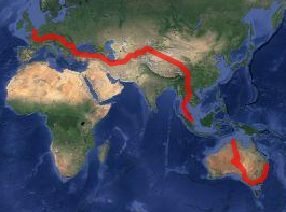 In short, the map above is a guide, a model of how the route down under may look; a slow traverse of Europe, before navigating the Middle East, through into China, before pedalling through South-East Asia, and cutting across the heart of Australia. But… even that may change – it looks like you’ll just have to follow the blog, and discover, at the same time as me, how the ride actually takes shape!